UPPER MERION | More than 100 students at Upper Merion Area High School took a break from studying for their final exams and finishing up their end of the year projects to play Super Mario Kart, a driving-based videogame. There was an interesting twist to the game, however; students played while wearing “drunk driving” goggles or while receiving and sending text messages on their cell phones. The event was hosted by the Upper Merion Area Community Alliance for a Safer Tomorrow (CAST) and members of the Upper Merion Area High School Students Against Destructive Decisions Club (SADD) as part of Global Youth Traffic Safety Month. For more, click here. SPEAK OUT: Middle School students strive to make tobacco history. UPPER MERION: Students at Upper Merion Area Middle School celebrated National Kick Butts Day with with an after school "Speak Out" facilitated by students from the Community Alliance for a Safer Tomorrow (CAST) Club. On August 31st, International Overdose Awareness Day, CAST participated in a walk to raise awareness that overdose deaths are preventable. The walk took place at the Montgomery County Courthouse in Norristown. For more information, click here. 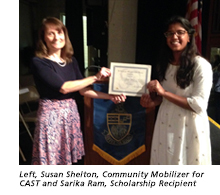 On Friday June 9th, the Community Alliance for a Safer Tomorrow (CAST) awarded a $1000 scholarship to graduating senior, Sarika Ram, at Upper Merion Area High School's Ivy Day Ceremony. 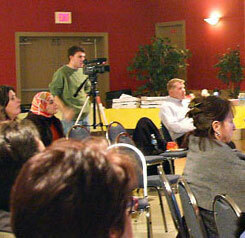 CAST's mission is to prevent and decrease drug abuse and violence among youth. Sarika was selected on the basis of an essay that she submitted to CAST as well as her attendance at CAST events and participation in social media campaigns. The CAST essay contest required students to research the college that they would be attending to determine what measures were in place to help students avoid substance use and binge drinking and to suggest additional ideas to address these issues. Sarika will be attending Boston University in the fall and is looking forward to seizing the opportunity to learn from her professors, absorb the culture of the surrounding city, and to give back to her local and global community. She believes that it is up to students like herself to change the culture of college campuses and to find safe alternatives to the college party scene. With school closed for the summer, students from the Upper Merion Area School District will lo longer see the trees they decorated this past spring as part of their 2 INSPIRE PA, INSPIRATION GROWS campaign, but they are hoping that community members and businesses will continue to add their support during the summer. CAST is pleased to announce that it received a $1000 grant from the Board of Community Assistance. In addition, Melody Pryor, a 2017 graduate, received a $10,000 scholarship from the BCA, and as part of her scholarship agreement, she will be completing 50 community service hours for CAST. The Upper Merion Area Community Alliance for a Safer Tomorrow (CAST) is a coalition of individuals from all sectors of the community working to create a healthy, safe, drug-freecommunity for youth. Recognizing that student athletes may take prescription opiods for their sports injuries, CAST partnered with the Upper Merion Area High School Athletics Department to educate athletes and their families about the dangers of prescription abuse. Forty-one locations around Montgomery County will be collecting unused prescription drugs this month for the annual drug Take Back Day. Montgomery County District Attorney Kevin Steele and the Police Chiefs Association of Montgomery County have announced that between 10 a.m. and 2 p.m. on Saturday, April 29, dozens of Montgomery County locations will be collecting unused drugs. NORRISTOWN >> A Philadelphia man has been charged with Drug Delivery Resulting in Death and related charges for the Feb. 23 overdose death of Roger Korfman, 52, in Upper Merion. Suddenly it seems as if proposals to establish medical marijuana growing facilities are sprouting up all over the place. The celebration of Community of Caring / Red Ribbon Week, October 24-28, was a special week at Upper Merion Area Middle School. Organized by Mr. Adam Slavin, Principal, and Community Mobilizer for CAST, Ms. Susan Shelton, it featured activities designed to promote character and a drug-free lifestyle. As Upper Merion Area High School students filed into the auditorium for their Red Ribbon Week assembly, they saw the stage lined with dozens of photos of teens and young adults who died as a result of accidental overdoses. CAST was proud to be one of the represented organizations at the District’s ESL Night. We were able to offer brochures in Spanish and educate families of many different backgrounds. Families had fun spinning the Prize Wheel and learning about prescription drugs, marijuana, alcohol, and vaping. July 26, 2016 | Susan Shelton, Community Mobilizer for CAST, and Kate Pietrowski, CAST coalition member, attended the Addiction Caucus and Like-Minded Rally at the Democratic National Convention in Philadelphia in July. A similar event was held at the Republican National Convention in Cleveland because Addiction doesn’t care if you are a Democrat or a Republican. For more on the Addiction Caucus, click here. 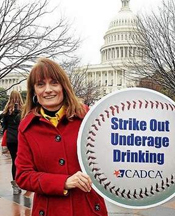 July 17-21, 2016 | Community Mobilizer, Susan Shelton, joined approximately 2,000 substance abuse prevention and treatment specialists from across the country in Las Vegas July 17-21 for CADCA’s (Community Anti-Drug Coalitions of America) 2016 Mid-Year Training Institute. The week-long training taught participants how to address one of our nation’s biggest public health challenges – youth drug use. CADCA’s Mid-Year Training Institute is a one-of-a-kind intensive training opportunity, offering more than 70 half-day and two-day courses geared towards helping participants find solutions to their community’s toughest substance abuse problems. Susan Shelton, Community Mobilizer for CAST, was among the invited members to attend NBC 10’s Town Hall Meeting on Heroin Epidemic in Pennsylvania. Held at Philadelphia’s National Constitution Center on April 12th. The event was the culmination of six months of investigative reporting by NBC10 reporters Vince Lattanzio, Denise Nakano and Morgan Zalot as part of the "Generation Addicted" series, an in-depth look at the heroin epidemic in our area and beyond. The event featured White House Director of National Drug Control Policy, Michael Botticelli. Thank you so much to Susan Shelton of the CAST Program for inviting Pillars of Light and Love to speak to 4-6th graders about Self-esteem, Gratefulness and Kindness this week! We had a wonderful time and were touched by the beauty, sweetness and diversity of the children and their parents. Looking forward to coming back soon! CAST is sponsoring a seminar, "Is this Normal? ", which will be held in Room C-230 at Upper Merion Middle School (450 Keebler Road., King of Prussia) at 7:00pm. Guest speaker will be Kristin Nordeman from the Minding Your Mind Foundation. Community Alliance for a Safer Tomorrow (CAST) is sponsoring a seminar presented by Attorney George Nikolaou, "Teens, Parents & the Law: Making Good Decisions" on January 19th in the Large Group Instruction Room (LGI) at Upper Merion Area High School starting at 6:30 pm. Three months after Montgomery County announced a standing order allowing pharmacies to distribute overdose-reversing drug Naloxone, officials continue to spread the word about efforts to reduce the heroine and opiod epidemic. A new student group is forming at Upper Merion Area Middle School, thanks to Ed Gerety, a professional youth speaker and leadership trainer. Upper Merion Area Middle School celebrated Community of Caring and Red Ribbon Week Oct. 26-28. 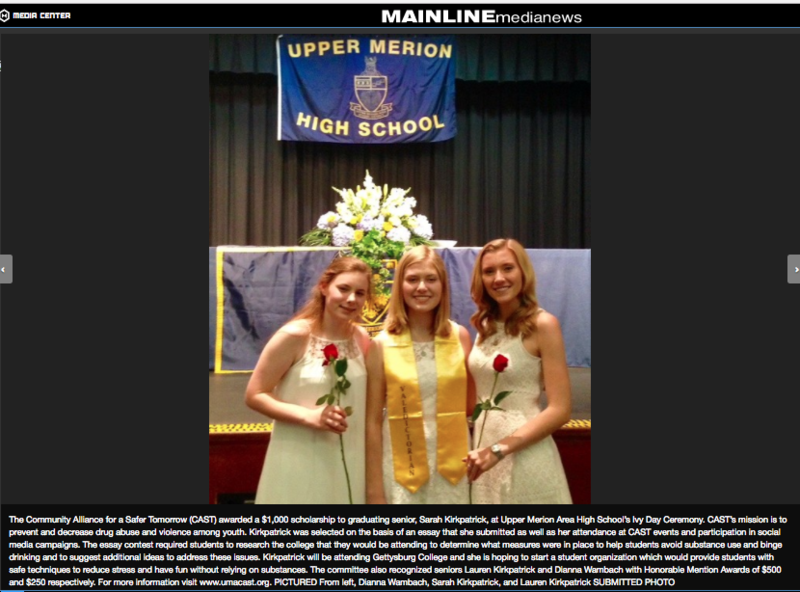 On June 8th, the Community Alliance for a Safer Tomorrow (CAST) awarded a $1,000 scholarship to graduating senior, Colleen Bullock, at Upper Merion area High School's Ivy Day Ceremony. "We dont need drugs, or alcohol to have fun" was the special message at the "Natural High" Kite Flying Event on Field Day at Upper Merion Area High School on May 22. NORRISTOWN >> Nearly 900 pounds of unused medication were turned in two weeks ago when the county held its drug take-back program on April 25 at a number of police stations across the county, according to a press release sent out Monday. The Red Ribbon on the Canale family's home was hung to show the family's commitment to a drug-free lifestyle. They added the words, "Love Yourself, Be Drug Free." Volunteers from the Upper Merion Community planted 32 trees. UPPER MERION >> Stuents encouraged to live drug-free every day if the year. The celebration of Community of Caring / Red Ribbon Week, Oct. 27-31, was a special one at Upper Merion Area Middle School, organized by Dr. Geller, Principal, and Community Mobilizer for CAST, Susan Shelton, featuring activities designed to promote character and drug-free lifestyles. UPPER MERION >> The Community Alliance for a Safer Tomorrow is holding a seminar "Supporting Teens in Building Resistance and Self-Control" 7pm, Oct. 29 in the Large Group Instruction Room at Upper Merion Area High School. UPPER MERION >> Throughout the last week of October local students have worn red to school to support the national Red Ribbon Campaign and to symbolize their commitment to living drug free lives. The Upper Merion Area Community Alliance for a Safer Tomorrow (CAST) and the Coalition for a Tobacco-Free Montgomery County joined forces on Kick Butts Day, March 19th, a National Day of activisim against Tobacco. On Wednesday March 26, in the Upper Merion Area High School Large Group Instruction Room, participants are invited to investigate a mock teen bedroom to identify the signs of risky behavior including drugs and alcohol use, violence, dangerous challenges, mental health issues and more. Susan Shelton, Community Mobilizer for the Upper Merion Area Community Alliance for a Safer Tomorrow (CAST) traveled to the Washington, D.C. area earlier this month to join more than 2,500 substance abuse prevention specialists and advocates from throughout the country for Community Anti-Drug Coalitions of America’s (CADCA) 24th Annual National Leadership Forum. UPPER MERION — Students at Upper Merion Area Middle School celebrated its commitment to fostering a diverse drug-free community last week. As part of the Middle School’s Community of Caring Week, students and faculty hosted activities promoting diversity and drug-free lifestyles. In celebration of Red Ribbon Week, State Representative Tim Briggs became a very special helper as Upper Merion Area Middle School CAST Club students planted red tulip bulbs in promise of a drug-free life. On June 4, 2013, Susan Shelton joined CAST as the new Community Mobilizer. In addition to teaching elementary and special education for eleven years, Susan has fifteen years experience serving Upper Merion as a volunteer in numerous school and community organizations. Community is very important to her, which is why she is so excited to begin this new role. Years ago, Susan read a sign at the Philadelphia Zoo that said, "Never doubt that a small group of thoughtful, committed citizens can change the world. Indeed, it is the only thing that ever has." -Margaret Mead. Those words resonated with Susan and have stayed with her, becoming an integral part of who she is. Susan is looking forward to partnering with community members and organizations to promote a drug-free, violent-free community. "I know there will be difficult tasks to overcome and some seemingly overbearing workloads to manage, but I also know tht I will never feel the need to turn to drugs and alcohol in order to cope with the stress, and I will do my best to make my peers feel the same way." "School officials need to work with students in the fight against addictive substances. They need to convince the student body that there are far more fulfilling and sustainable ways to have fun than abusing drugs and alcohol. I never want to engage in substance abuse and I hope to prove that I am not alone in this fight for a healthier world." "When I attend college, I hope to encourage others as well as myself to stay away from alcohol and other substances. Instead, I will invest all my time in my work, and fun clubs and activities. I will aim to be the best student that I can, as well as the best person that I can be. Alcohol and substance use will only hinder me from reaching my goals and achieving excellence." "I look forward to going to a school that makes me feel special, like I can conquer anything, and above all, safe." "There will be pressures to fit in, but I know that I am stronger than peer pressure. I will rise above the influence, be successful in my major, and make healthy choices that will not only control me, but also the people who are around me. I will surround myself with the right crowd, and resist the temptations that fall in my way. I cannot wait to have the time of my life making healthy decisions throughout the next four years."